“The protection of EU’s financial interests is also protection of your interests” – this was the thought-provoking message from an OLAF (EU Anti-Fraud Office) Liaison Officer to Ukrainian police officers at an expert conference organised by the European Union Advisory Mission at the premises of the National University of Internal Affairs yesterday. Ukraine is responsible for recovering lost EU funds as a guarantor of the economic assistance that it receives from international donors. As the EU steps up its support to Ukraine, Ukrainian law-enforcement agencies are facing the prospect of investigating possible fraud cases involving EU funds in Ukraine. The Ukrainian authorities are well aware of this challenge: this year, the Ministry of Internal Affairs has started to set up a special unit for coordinating the efforts of agencies responsible for investigating such cases. However, law-enforcement professionals working in the field still lack specific expertise in this field. 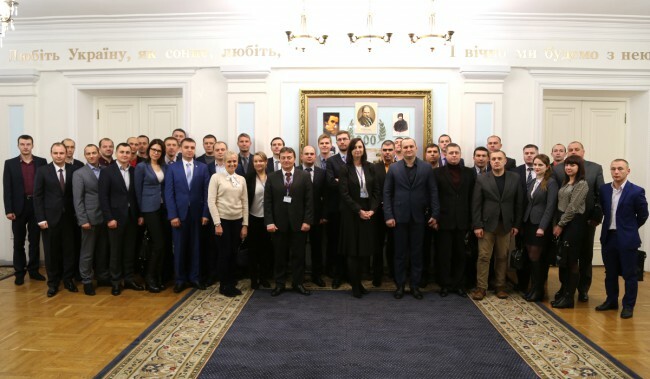 To help close this gap, EUAM and the National Academy brought 53 investigators and operatives from all regions of Ukraine to Kyiv to discuss the way forward. In her greeting remarks, Lynn Sheehan, EUAM’s Deputy Head of Operations, pointed out that this conference opened a new avenue for the ongoing cooperation between the Mission and the Ministry of Internal Affairs. Mr Ruslan Fufalko, deputy head of MoIA’s International Cooperation Department, reminded the participants that Ukraine had legally committed to investigate crimes regarding EU funds in the EU-Ukraine Association Agreement. The conference managed to pull together relevant expertise from all key actors of the EU family in Ukraine: the EU delegation, EUAM and OLAF. Two invited representatives of the EU Delegation in Ukraine spoke about the political and trade-related provisions of the EU-Ukraine Association Agreement. “The provision on protection of EU financial interests” in this crucial document “is an area yet to be fully elaborated”, admitted Evelina Schulz of the EU Delegation, as it had never been included in previous EU agreements with third countries. In a bid to increase awareness of our counterparts of how EU tackles threats to its financial interests, four EUAM presenters discussed EU integration and institutions, EU budget formation process and coordination practices. The conference concluded with a set of eight recommendations on possible further training, which were brainstormed during a lively discussion with Ukrainian police officers. The police officers assured the Mission of their willingness to work with European colleagues to protect the EU’s financial interests.